"New Zealand scientists have found evidence that the Southern Hemisphere may have escaped the extremes of the last Ice Age which froze much of Europe, Russia and North America"
"A massive iceberg that had been blocking traditional shipping routes to McMurdo Station, the National Science Foundation's research station in Antarctica, snapped in two seemingly overnight"
"In an astonishing announcement on global warming and extreme weather, the World Meteorological Organisation has signalled that the world's weather is going haywire"
"The ice covering the Arctic Ocean is getting thinner as summers lengthen, say British scientists"
New research suggests emissions of black soot alter the way sunlight reflects off snow. According to a computer simulation, black soot may be responsible for 25 percent of observed global warming in the last century. Soot in the higher latitudes of the Earth, where ice is more common, absorbs more of the sun's energy and warmth than an icy, white background. Black carbon, or soot, absorbs sunlight, while lighter colored ice reflects sunlight. Soot in areas with snow and ice may play an important role in climate change. Also, if snow and ice-covered areas begin melting, the warming effect increases, as the soot becomes more concentrated on the snow surface. "This provides a positive feedback (i.e. warming); as glaciers and ice sheets melt, they tend to get even dirtier," said Dr James Hansen. Hansen and Larissa Nazarenko, both of the Goddard Institute and Columbia University's Earth Institute, found soot's effect on snow albedo (solar energy reflected back to space), which has been neglected in previous studies, may be contributing to trends toward early springs in the Northern Hemisphere, thinning Arctic sea ice, melting glaciers and permafrost. Soot also is believed to play a role in changes in the atmosphere above the oceans and land. Soot's increased absorption of solar energy is especially effective in warming the world's climate. This forcing is unusually effective, causing twice as much global warming as a carbon-dioxide forcing of the same magnitude. Although the role of soot in altering global climate is substantial, it does not alter the fact that greenhouse gases are the primary cause of climate warming during the past century. Greenhouse gases are still expected to be the largest cause of climate change for the rest of this century. The researchers found that warming in the Northern Hemisphere was large in the winter and spring at middle and high latitudes. These observations were consistent with the researchers' climate model simulations, which showed some of the largest warming effects occurred when there was heavy snow cover and sufficient sunlight. 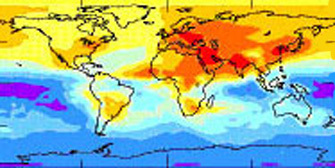 Hansen and Nazarenko used a leading worldwide-climate computer model to simulate effects of greenhouse gases and other factors on world climate. The model incorporated data from NASA spacecraft that monitor the Earth's surface, vegetation, oceans and atmospheric qualities. The calculated global warming from soot in snow and ice, by itself in an 1880-2000 simulation, accounted for 25 percent of observed global warming. Global mean surface temperatures have increased 0.5 to 1.0 deg.F since the late 19th century. The 10 warmest years all occurred in the last 15 years of the 20th century. 1998 was the hottest year since records have been kept. Globally, sea level has risen 4-8 inches during the last century. Worldwide rainfall over land has increased by about one percent. The frequency of extreme rainfall events has increased. 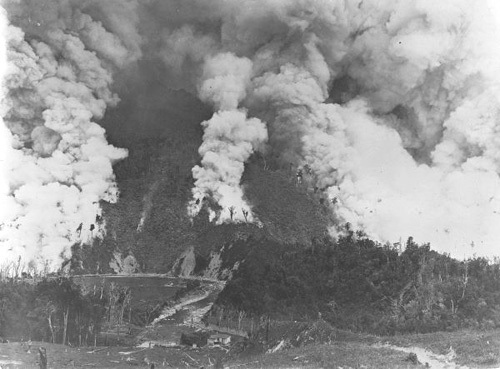 The start of a large 30,000 acre fire in 1900, lit to clear the land of native forest for sheep grazing at Puketora Station on the east coast of New Zealand. Black carbon or soot is generated from traffic, industrial pollution, outdoor fires and household burning of coal and biomass fuels. Soot is a product of incomplete combustion, especially of diesel fuels, biofuels, coal and outdoor biomass burning. Emissions are large in areas where cooking and heating are done with wood, field residue, cow dung and coal, at a low temperature that does not allow for complete combustion. Researchers have found that the amount of sunlight absorbed by soot is 2 to 4 times larger than previously assumed. Larger absorption is due in part to the way the tiny carbon particles are incorporated inside other larger particles: absorption is increased by light rays bouncing around inside the larger particle. Soot also affects the melting of alpine glaciers and peaks. 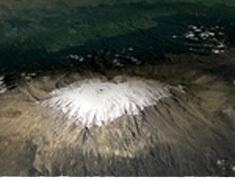 Some scientists believe the snow cap of Mount Kilimanjaro, Africa's highest mountain, will be gone in two decades. The snow cap that formed 11,000 years ago shrank by 80 percent during the past century. 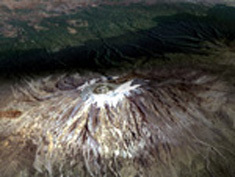 The Landsat satellite captured the images of Kilimanjaro shown above on February 17 1993 (upper) and February 21 2000 (lower). Top right: Frederick Ashby Hargreaves (1854-1946). Permission of the Alexander Turnbull Library, National Library of New Zealand, Te Puna Matauranga o Aotearoa, Wellington must be obtained before any re-use of this image.